On a sunny day last May, Jan Quintrall decided to do something most people in her office don’t. The director of the city’s Business and Developer Services set aside four hours of her day to roam the sidewalks and skywalks and talk to strangers about parking in Spokane. Overwhelmed after just an hour and 10 minutes, she’d gotten her answers. People hated the parking kiosks the city tested near River Park Square and on Post Street, and preferred meters, but only if they could pay with credit or debit cards. Now, the city is overhauling its on-street parking system with an eye toward bringing Spokane into the 21st century and maximizing revenue. About $1 million of new technology will enable the city to give more tickets and allow people to pay them online in an effort to chip away at unpaid parking tickets. There have been some $4.4 million in unpaid tickets issued in the city since 2002. A contract is underway with a nationwide company, Duncan Solutions, to provide new handheld technology for issuing tickets, and license-plate-reading cameras to install on parking enforcement vehicles which patrol unmetered areas with time limits, like the two-hour spots near the courthouse. The cameras will read license plates parked at the spot, then when the parking enforcer returns two hours later, read them again to see who’s overstayed. Today, they only chalk car tires if they receive complaints, Quintrall says. Now, the city is looking at two proposals for new “smart meters,” which take credit and debit cards and collect data like the average time people park at each spot. The meters will include sensors to tell whether a car has moved out of the spot (clearing the meter) or if the car remains when the meter expires (notifying parking officials so they can ticket more efficiently than wandering downtown). 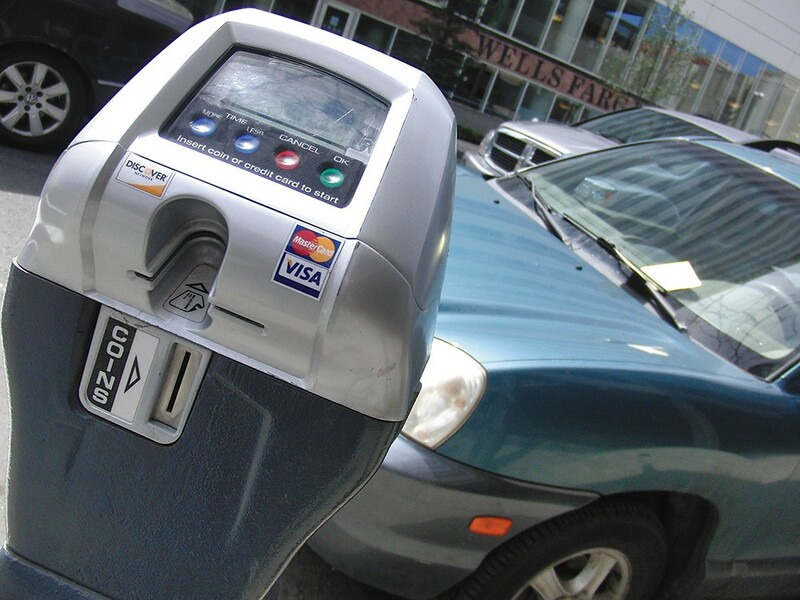 The changes are the latest step in a process of trying to rebrand the city’s parking system. The city is combining its parking funds to better track how much it’s making from fines and tickets. Enforcement officers have been renamed “parking ambassadors” to make them seem more friendly. The Downtown Spokane Partnership also wants stickers on the new meters to tell payers their money is going to sidewalks and landscaping, rather into the general city coffers. A booting ordinance to punish those with large numbers of unpaid tickets is expected to follow. Between now and September, when the new technology is expected to be installed, the city will reassess all parking spots, loading and taxi zones downtown “block by block” looking for ways to increase parking and make spots more efficient. In a 2004 study updated in 2010, a Portland-based consulting firm found that downtown Spokane parkers stayed an average of one hour and 20 minutes. At a finance committee meeting last month, Dave Steele, also from Business and Developer Services, which oversees parking, told council members and staff about how new technology will allow better data collection to capitalize on those trends. Steele said two hour meters not only give the city extra cash, but parkers peace of mind knowing they have more than 90 minutes.